What not to do when chicken pox? When can I start to wash after chicken pox? Chickenpox is an infectious disease, with a rash all over the body. This files most often occurs in childhood, but sometimes the infection and an adult. Dangerous chicken pox for an infant? Varicella (chicken pox) is transmitted by airborne droplets and is caused by the herpes virus. This disease is very contagious, it is easy to pick up, being in a confined space with the patient. The incubation period of chickenpox (quarantine) lasts from a week to three. The most dangerous is that infection carrier itself may not know it, because it is considered contagious 2 days before the rash appears and for about a week after the last eruption. With the defeat of chicken pox is very strongly suppressed by the human immune system, which can lead to complications and other diseases. It is especially hard tolerated in adults and children takes place in a milder form. Often manifestations of this disease in children are: fever (some up to 40 ° C), fever, rash in the form of pimples with fluid, itching. If new lesions no longer appear and old ones dry up, it means that the child is recovering. Traces of the disease usually does not remain, except spots brushing of the skin. After people have been ill with chickenpox, he formed immunity to re-infection. And it is believed that it is better to move in childhood. Most often the infection occurs in places of a congestion of people: kindergartens, schools, various clubs, etc. 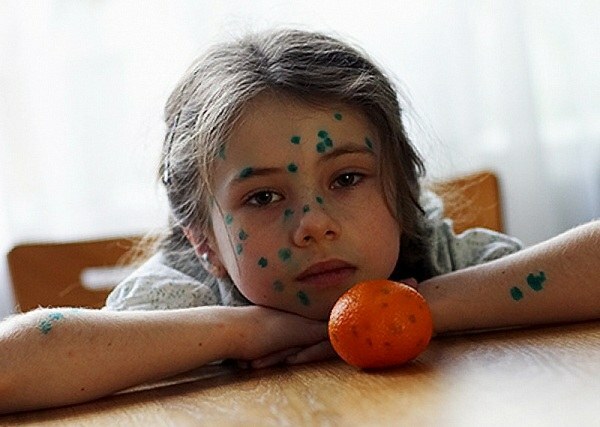 When the disease chickenpox children feel differently. Treatment from chicken pox does not exist, you just have to try to ease the symptoms of the disease. If highly elevated temperature 38оС - should be given antipyretics; rash is to smear with brilliant green, potassium permanganate and other means appointed by doctors. If a strong itch - antihistamines to give devices and lubricate the skin with special ointments/gels. On average, the disease of chickenpox lasts about 10 days. It was at this period the patient should be isolated from others so as not to cause mass infection and not to endanger people who cannot afford to get sick for various reasons (pregnant women, before surgery, etc.). No special restrictions do not exist, you just have to look at the condition of the child, its well-being. If a baby has no fever, and new lesions, and the street is very good weather, the contraindications to walk there. The only thing you have to consider that the child may still be contagious and hanging out in public places (parks, playgrounds) unethical. If you live in a private house, then a small amount of fresh air couldn't hurt. Only we must remember that the body is sick the baby is still very weak, and hypothermia, as well as a strong pack can lead to complications of the disease. Try to observe the thermal conditions and standards of hygiene, and the healing process will go much faster.